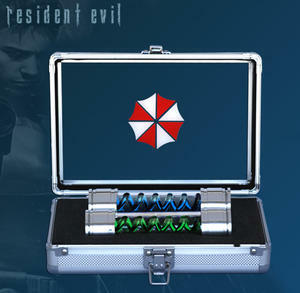 Officially licensed Resident Evil T-Virus and Anti-Virus Prop Replica, with custom aluminum case. Each vial measures just over 5" long and is an accurate replica of this quintessential Resident Evil prop. Constructed from aluminum and Plexiglas, each vial has internal LED's so that they can be independently illuminated. 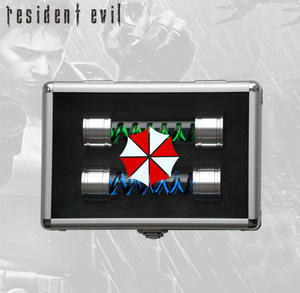 They come complete with a custom aluminum display case with a clear top and Umbrella Corporation logo, so they may be displayed with the case open or closed. A must for any Resident Evil fan!